BAHAMA MAMA was designed for Gary Clements of GFC Boats. He wanted a shallow draft cruising sailboat to be built with modest means, have accommodations for 4 or 5 people, and standing headroom in the cabin. She has big boat capabilities. 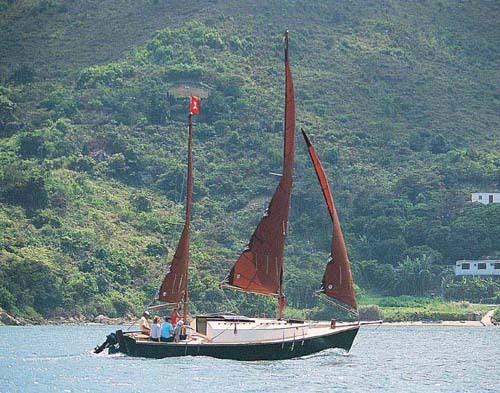 She is ideal for island hopping to a secluded anchorage. She will sit upright when the tide runs out [centerboard version]. Both tandem centerboard and keel versions are available. Look for a design review in WoodenBoat (May/June '94). Construction is tack and tape plywood and epoxy. Plans include: materials, panel dimensions, construction, two interior arrangements, sail plan and rig details. No lofting is required. Build her and enjoy the carefree cruising lifestyle. Purchase and Download Study Plans for the BAHAMA MAMA for $5.00 in PDF format (zipped file). Purchase Construction Plans for the BAHAMA MAMA - CENTERBOARDS for $440.00 for delivery by US Postal Service. 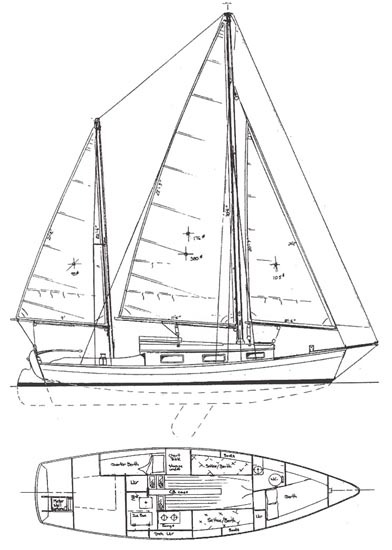 Purchase Construction Plans for the BAHAMA MAMA - KEEL for $460.00 for delivery by US Postal Service.